Hi, all. How’s it going? Nesse episódio do podcast Inglês Online falamos sobre um ditado em inglês que diz que a gente colhe o que planta, mais usos do verbo reap (colher). So today let’s take a look at a popular saying in English: you reap what you sow. You reap what you sow. We have a similar ditado in Portuguese: “a gente colhe o que planta”. Have you ever heard this saying here in Brazil? Well, it is used by English speakers basically in the same way we use it in Portuguese: to say that what we experience, or the results we get, are consequences of our own actions. So let’s take a closer look at the key verbs in this saying: reap and sow. Sow is a verb frequently used together with the word “seeds”. Do you see the picture? That guy is sowing some seeds. 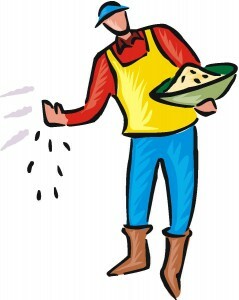 He’s spreading the seeds over an area of land and soon, if all goes well, some kind of plant will start growing there, and he will reap fruits or maybe grains. So the process of growing something on the land illustrates very well what this saying means. For example, if you sow orange seeds, you will eventually reap oranges. If you sow apple seeds, you’ll reap apples. If you sow corn, corn will grow and you won’t reap olives! You will reap corn. So figuratively speaking, if you sow lies and deceit, you will probably reap… something that is not good. You may end up without a job, or without support from other people and so on. What do you think about that? Would you agree that people reap what they sow? So of course the word “reap” is very often used figuratively in conversation. For example, people say that if you work hard at something, you will reap the rewards later. Reap the rewards. What does reward mean? A reward is something you get in return for doing something else, usually something good. So, let’s say, if you go to college and study really hard you will later reap the rewards of your hard work. You’ll probably get a good job, or you’re going to become a scientist and become very famous, something like that. Here’s an example: your friend Richard started eating more veggies six months ago and now he’s reaping the rewards. He feels better and he looks better, so he’s reaping the rewards of his dietary change. Many bloggers are reaping the rewards of putting a lot of work into their blogs over the years. Can you think of an example from your own life? Maybe you abandoned a bad habit some time ago, and now you’re reaping the rewards of doing so. Maybe you started saving some money last year and now you’re reaping the rewards: you have enough money to fulfill your dream of traveling around the world. What’s your example? And, finally, it is also common to say that, after saving some money, or working hard, you’re now reaping the fruits of your actions. Of course, the fruits can be bad or good, depending on your actions. For example, if you kept lying to a friend in order to take advantage of him, and… let’s say your friend just found out about all your lies and he never wants to see you again, and he’s telling everyone about how you’re such a big liar. Well… it looks like you’re reaping the fruits of all that lying, right? So let us know about your example. A genuine example; something that really happened in your life. Are you reaping the rewards of something you did in the past? Talk to you next time. ESTOU AMANDO OS PODCASTS…BAIXEI NO IPHONE!!!! MUITO OBRIGADA!!! Actually I´m still sowing. I was a kind of dropout in my teenage years. despite that I got a nice job, and for 15 years I felt that studying was not worth because I had already got where I wanted to without studying. my mistake. 5 years ago I found out that I was in the wrong path and decided turn back. I finished right school and got to college. now I´m in the seventh period of production engineering and for sure I´ll reap exactly I´m sowing in the future. By the way I´m 40 years old today. Hi, Gilmar. So, how do you like the engineering course? It’s demanding, isn’t it? Hope you’re enjoying it!! Adele also says: “You pay me back in kind and reap just what you sow” in Rolling in the Deep! I was listening to the music and remembered this tip! Cool, Veronica. Love when that happens! Hello all (I always wanted to say like you Ana, rs). First, I don’t feel confident to express myself in English, but I’m gonna try to do. If we reap really hard study of these podcasts we eventually sow success in english language. Very good issue you explained here! I am enjoying this course. I hope learn very more with you. I really enjoyed your podcasts…. they help me a lot given that I dont have so much time available to practice English as I had before. So… by listening them is the best way I have to do that. keep going! congrets. Gostaria que vc me indicasse um livro que eu possa usar em aulas particulares de inglês para conversação!! Obrigada!!! Oi Renata – não tenho nenhum para indicar, mas acho q vc encontra material se colocar ESL conversation no Google! Pessoal, estou adorando ler os exemplos. Continuem ouvindo – keep listening to this and other podcasts! Ana, correct me if I’m wrong, please. Thank you in advance. a) I’m reaping the rewards of getting married with an excellent man and we have together an adorable daughter. That’s good post, maybe one more, but I would like to grab you. You’ve been doing excellent posts and I like it a lot, share to my friends and recommend it as much as I can. Related today’s post, I could comment about the life of mine. I started in college early, I was seventeen when I had the firsts classes. Most of people with the same age it was thinking at party, peace and job. I was worry with the future, today I reap a little what I sow, while some friends keep up their lives at the same way they had at the time. I believe that the life is like a mirror, and all our effort reflect an answer in our life. That’s why I believe your blog will become one of the most accesed soon. Today I’m enjoying my fruits of change a bad life style for another much better. I have been practicing karatê for six years. I have increased my self-respect and self-confidence. I achieved many medals and many friends too, good friends. I will not give you an example, but I’ll write what I posted today in the facebook. And love comes back to you. hello! I’m reaping the rewards of start going to the gym 1 and half year ago and I’m in fit and I’m feeling very well! And I’m reaping the rewards of study English since my 11 and now I can understand these podcasts clearly! Thank you for always help us! Kisses! I´m reaping the rewards of have listened a lot of Ingles Online podcast because now I can understand yours tips clearly.